Vertical gardens are nothing new — avid readers of Inhabitat may even remember PNC Bank’s announcement that it completed North America’s largest living wall back in September — but the garden currently being planned for a Portland, Oregon high-rise is one of the most unique we’ve seen. A series of 250 foot tall trellises will shade the west side of the 18-story Wyatt Federal Building, which is undergoing a $135 million green remodel by SERA Architects courtesy of federal stimulus funds. 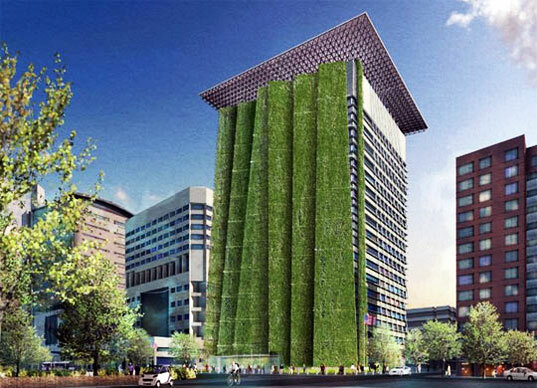 Unlike in traditional vertical gardens, the Wyatt Federal Building will feature a series of seven so-called “vegetated fins” will jut out from the building as a framework for planters. There are a number of advantages to building the garden on the 150 foot long west wall of the building — cooling and shade for the building, eye candy for the crowds below, and the light admitted into the building during the winter by bare stems and leaves. But many kinks have yet to be worked out, including how to water, weed, and fertilize crops located 200 feet in the air. The vertical garden isn’t the only new feature for the high-rise. Other improvements include solar arrays, a smart lighting system, and electricity-generating elevators. Beautiful! But why do I have to pay for it? Their so-called kinks or very easy to sort out for anyone who knows a little something about plants. Simply plant native climbing plants and/ or ground covers which will survive on the rain the city already gets and the dead vegetation from each season will fertilize for the next. Fabulous (and beautiful) plan. But those are some pretty crucial kinks! I look forward to hearing about how they eventually work out those processes. Vertical gardens are nothing new -- avid readers of Inhabitat may even remember PNC Bank's announcement that it completed North America's largest living wall back in September -- but the garden currently being planned for a Portland, Oregon high-rise is one of the most unique we've seen. A series of 250 foot tall trellises will shade the west side of the 18-story Wyatt Federal Building, which is undergoing a $135 million green remodel by SERA Architects courtesy of federal stimulus funds.